Some interconnect cables are fitted with so-called locking male RCA connectors (most notably made by WBT of Germany, but there are other brands as well). 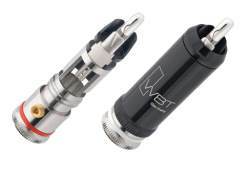 These connectors feature a rotating barrel with a narrowing tip that applies increasing pressure to the ground flanges with clockwise rotation. Turning the barrel counter-clockwise reduces the pressure. The idea is that tightening the grip of the male RCA on the female RCA improves contact and therefore performance. The key to realizing the potential of these connectors is their proper use. Most people would assume that you simply loosen the barrel, mate the male and female connectors and tighten the barrel to “lock” them together – but that’s not the way they are designed to work. Tightening the barrel after the two connectors are mated does not result in the tightest possible contact and the connection will likely loosen over time. The reason is that the plastic thread on the body is so coarse that it locks as soon as it meets resistance. Not only do you not get the tightest initial contact, it will also tend to slip with time, loosening quite dramatically in some cases. Instead, the barrel should be seen as a tensioning device: set it – push the plug onto the socket – if it’s loose, remove the plug, tighten the sleeve slightly and insert again. Repeat until you have a nice, positive connection. It may be a bit tedious, but it guarantees not only the optimum connection, but one that stays tight. Remember that prior to making any connection; be sure both connectors are scrupulously clean. Our preference for the best, zero-residue cleaner is Kontak. Read more about cleaning your connectors in our article "How to Improve Your System For Free (Almost! ).